You know you’ve finally found the right crust recipe when your kids are comparing great pizzas and they say, “They still don’t beat your crust.” That took a lot of effort. Making a whole wheat crust is difficult because it can be too tough, thick, chewy, etc. I had to learn to spread the dough out thin so it wouldn’t end up 2 inches thick. Through trial, error, and some learned technique, I have a crust that’s tasty enough and thin enough that everyone loves. I hope you like it to. White flour works wonderfully for this recipe, but we prefer to use half whole wheat, half unbleached white flour. Dissolve yeast in water and sugar for about 5 minutes. Add 4 cups of flour and salt. Mix together. Slowly add flour until you have a nice soft dough. Spread onto a peal or other pizza dish, cover and let rise for 1 hour. Baking time will vary depending on thickness, but plan on 15-20 minutes in a 400 oven. And what goes best with pizza? Why, breadsticks of course. This is my favorite bread stick recipe that I’ve developed. These are pizza hut style, made in a pan, then sliced apart. You can always roll them into sticks and place them on a greased cookie sheet and bake for 15 min or until they just start to brown (don’t over bake). Add oil, flour and salt. Knead for 5 minutes. Place dough in a greased 9x12in. glass dish. Spread with fingers until flat. 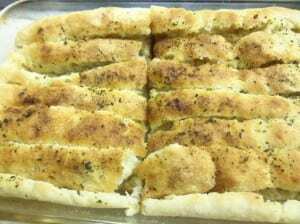 Cut into 10 breadsticks (2 rows of 5) with a knife or pizza cutter. 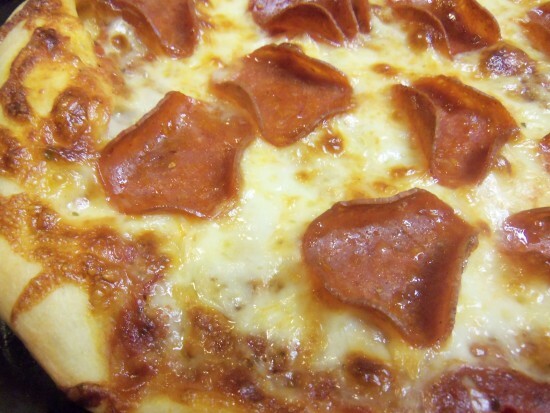 Sprinkle with garlic powder, cheese, and oregano. Cover and let rise for 30-45 minutes. Bake at 375 F for 25-30 minutes. This looks delicious! I love a good pizza crust. Will definitely have to try this!